At a speech about his presidential center at Southern Methodist University in Dallas this afternoon, George W. Bush told a supportive crowd that he has had time to reflect in office over the past nine months. Mr. Bush said there were ups and downs, but through it all he "always did what I believed was in the best interests of our country." And, he told the crowd to raucous applause, "I came home to Texas with my values intact." Mr. Bush was speaking to launch the George W. Bush Presidential Center, which includes a public policy institute with the mission of promoting the goals and values of his presidency. There are three components to the center, he said: An archive, museum, and the policy institute. The archive will include the documents and records of Mr. Bush's time in office, and will house "four million photos; thousands of boxes of documents; and hundreds of millions of e-mails," according to the former president, who said he is using the materials to be housed there for his forthcoming memoir. The museum, he said, will tell the story of the Bush presidency "through my most consequential decisions." (His memoir, which is planned to come out next fall, will have a similar format.) "Visitors will see the bullhorn I used in my first visit to Ground Zero, a replica of my Oval Office, and our very own 'Texas Rose Garden,'" he said. The policy institute, which will be called the George W. Bush Institute, will be "a vibrant hub of principled thought and practical action," the former president said. He said the institute will follow his principles, which include the idea that "free markets open the path to opportunity, that a successful society requires personal responsibility, that freedom is universal and transformative, and that every human life has dignity and value." The four initial areas of focus, he said, will be education, global health, human freedom and economic growth. Also present at the speech was former first lady Laura Bush, who discussed the institute's planned women's initiative. She spoke of the experiences of women in Afghanistan, Africa and elsewhere in the world. Mr. and Mrs. Bush's daughter Jenna was in the audience to see her parents speak. The fact that she is now a correspondent for NBC's "Today Show" prompted the former president to quip that she is "continuing the Bush family tradition of warm relations with the media." The president said ground will be broken on the center in a year, though programming for the institute will begin in the spring. At the end of his remarks, he made an appeal for donations to fund the construction and the center. 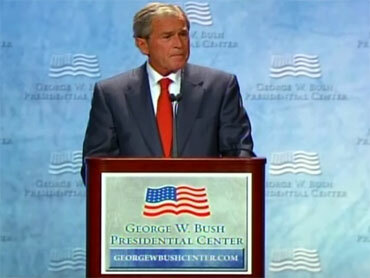 Sources tell the New York Times that the Bush foundation has thus far raised $212 million in pledges and contribution. Its goal by the groundbreaking is $300 million. The president said he was "thrilled" the center would be at SMU, saying it's "pretty exciting for a 63-year-old to be back on the college scene." "I enjoy popping in on a class from time to time...Come to think of it, that was my strategy as a student," he joked. The president also told his audience of more than 1,000 people that "there is life after the White House." "Laura and I are happy, healthy, and home – here in the Promised Land," he said. He said that they "may be retired, but I'm not tired." The president noted that he's previously given speeches in eight states, six countries, and five provinces in Canada. But while those had been relatively low-profile, this address appears to mark the former president's reemergence into the policy arena.